Donald Trump dispatched his acting chief of staff Mick Mulvaney to the US political talk-show circuit yesterday (March 18) to defend him after similarities were widely noted between Trump’s anti-immigrant, anti-Muslim rhetoric and the stated motives of the man charged with killing 50 people in New Zealand mosques. As Mulvaney was speaking, though, Trump was busy undermining his message. “Stop working soooo hard on being politically correct, which will only bring you down, and continue to fight for our Country,” Trump tweeted Sunday morning, urging Fox News to reinstate Jeanine Pirro, the night-time host suspended after suggesting that Minnesota Democratic congresswoman Ilhan Omar’s wearing of a hijab is unconstitutional. “Be strong & prosper, be weak & die!,” Trump tweeted, apparently urging Fox to resist pressure to suspend Pirro. The New Zealand shootings come amid growing white-supremacy sentiment in the US that terrorism experts have linked to Trump’s anti-immigrant rhetoric and his administration’s policies. The man arrested in the March 15 attacks wrote that he drew inspiration from the US, praised Trump, saying he hoped his attack would destroy America’s “melting pot dream.” He wrote that he considers Trump a “symbol of renewed white identity and common purpose,” and adopted symbols displayed by white supremacists in America. Muslim leaders in the US blame Trump directly for a rise anti-Islamic hate. CAIR says it has seen an “unprecedented spike in bigotry targeting American Muslims, immigrants and members of other minority groups” since Trump’s election. The FBI reported a jump in hate crimes in 2017, the latest full year available. 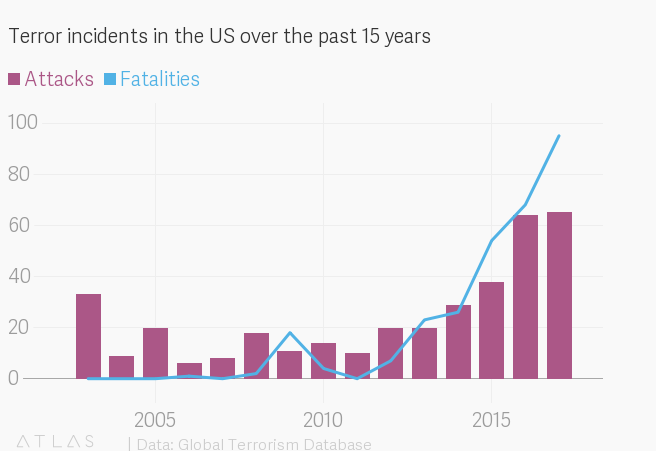 Terror attacks, which have fallen around the world, are on the increase in the US, fueled by a rise in strikes carried out by right-wing extremists. Nearly every fatal extremist attack in the US in 2018 was linked to an individual with ties to right-wing extremists, the American Defamation League said in January. Fatalities rose by 35% over the previous year, to 50. “White supremacy and far-right extremism are among the greatest domestic-security threats facing the United States,” in part because law enforcement hasn’t responded quickly enough to the threat, Thomas Cullen, a Trump-appointed federal prosecutor in Virginia, wrote in February. “At both the federal and state levels, immediate steps are required to curtail the alarming rise of hate crimes and extremist violence in this country,” he writes, including passing state hate crime laws and strengthening punishment for homegrown terrorists. Trump’s Department of Justice charged 54 members of Arkansas’s “New Aryan Empire” gang with attempted murder, kidnapping, and drug distribution in February, and 18 members of the “Universal Aryan Brotherhood,” and Oklahoma gang, with racketeering, kidnapping and drug crimes in December. Trump himself has made dozens of false and disparaging statements about Muslims, calling for surveillance of mosques, labelling Muslims a “problem,” and retweeting far-right hate groups like Britain First. By Trump’s executive order, the US has banned immigration from several Muslim-majority countries. It also has sharply cut the number of Muslim refugees admitted, and used divisive language to criticize Islam’s nearly two billion adherents, in sharp contrast to previous US administrations. Trump isn’t alone among US politicians in attacking Muslims. A poster connecting Omar, the first woman Muslim elected to Congress, with the Sept. 11, 2001 terrorist attacks, was spotted in at a Republican booth in the West Virginia Capitol this month. Omar was born in Somalia. The 9/11 attackers were predominantly from Saudi Arabia. The Trump administration refused to condemn Saudi leadership after the murder of Jamal Khashoggi, whose killing is believed to be tied to the Saudi crown prince, at a Saudi consulate in Turkey last year. In the hours after the March 15 shooting, Trump again referred to immigrants in the United States as an “invasion,” as he vetoed a congressional bill to block his use of an emergency declaration to use Pentagon money for his barrier on the southern border. Asked if he thought white nationalism was a “rising threat,” Trump said no. “I don’t really. I think it’s a small group of people that have very, very serious problems,” he said. Later that day, he announced a new “Make America Great Again” rally in Michigan. Trump’s rallies have become infamous as a stage for his verbal attacks against immigrants, Democrats, and the media. On March 18, Trump presidential advisor Kellyanne Conway went a step further, urging people to read the New Zealand shooter’s rant “in its entirety,” because she said it would exonerate Trump. The New Zealand diatribe urges others to make similar attacks, and anti-terrorism and anti-extremism experts specifically asked people not to share or spread it online to prevent further violence.